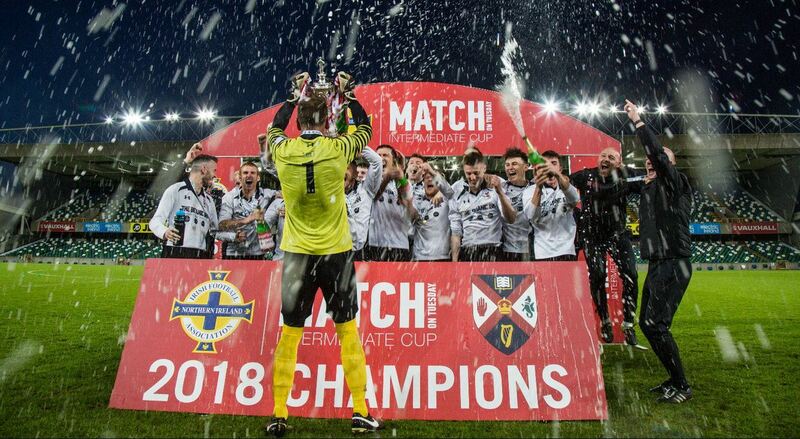 After waiting more than a century, Queen’s Football Club picked up its first major silverware outside university football on 8 May, when the students beat East-Belfast’s Dundela FC 4-1 at the National Football Stadium at Windsor Park in the Irish FA Intermediate Cup Final. First contested in 1892, the IFA Intermediate Cup is Northern Ireland's premier competition for clubs of intermediate status, with over 120 entering the 2017/18 tournament. The black and whites made a great start and were 2-0 ahead after 11 minutes thanks to goals from Eamon Fyfe and Matt McManus. League champions Dundela got one back in the second-half before – and very much against the run of play – Ciaran O’Hare netted Queen’s third. With just four minutes to go Ronan Young hammered home a free-kick to give the students an unassailable 4v1 lead. The University side last played in the Intermediate Cup final in the 1979/80 season when they were beaten 2v0 by RUC, the holders from the previous year. Several members of the 1980 team were present at Windsor Park last week to lend their support to the current team. The result was a huge achievement for the Queen’s players, manager Peter Thompson and for long-time Chairman Denis Clarke. Talking after the match, Peter Thompson (who played for Queen’s from 2002-12 when he took over as manager) said: "I am quite emotional, especially with family and friends in the stands. "But more for seeing our chairman Denis Clarke who has been involved with Queen's football for over 52 years." Speaking to the Belfast Telegraph about what the result meant to him, an emotional Denis Clarke who in February received the Dr Tony O’Neill Award for services to Irish Universities Football, said: “It’s just unbelievable; we rarely get to cup finals, so not just to win it, but to play so well it’s just fantastic! “It’s been a long time, I just love working with Queen’s over the years. I was a student there myself many years ago and played football for Queen’s but I never saw this coming. “This is the fifth time we’ve played Dundela this season and they won the other four, so it’s a fantastic achievement; the lads were brilliant. The Daily Mirror’s popular junior football supplement Match on Tuesday was announced in January as sponsor for the competition which dates back to 1892, a move which was seen at the time as further strengthening the IFA’s commitment to local football. A founder member of the Irish League B Division, Queen's plays home matches at the Dub – the University’s sports grounds at Upper Malone, Belfast. Queen’s allows for a 25% non-association with regards to playing staff whilst the other 75% are required to have studied, or be studying at the University. Established in 1910, Queen’s has won the Collingwood Cup (the Irish universities trophy) several times down through the years, though they narrowly lost the 2018 final 2-1, to an injury time goal by eventual winners UCD, which would have been the northerners’ first success since 1985. The winning team was: Declan Brown (captain), Adam Robinson, Ronan Young, Daniel Hanna, Matt McManus, Barry Walsh, Matthew Hughes, Ben Mulgrew, Ryan McCready, Connor Mulholland and Eamon Fyfe. Substitutes: Stuart Harper, Ciaran O’Hare; Sean O’Reilly, Josh Corry, Stuart Harper, Andrew Gawne. For further details please contact Queen’s AFC Media Officer Neil McGaughey or visit http://www.qubafc.com/. General inquiries to Gerry Power, Communications Officer, Development and Alumni Relations Office at Queen’s; tel: +44 (0)28 9097 5321.